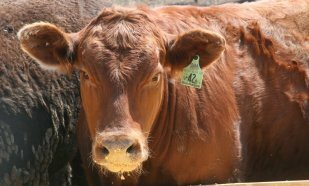 The function of crossbreeding is to maximize heterosis, or hybrid vigor, but it is important to utilize breeds whose genetics will compliment each other. SimAngusTM is the convenient way to capture heterosis and value. This crossbreeding system has the ideal balance of maternal and carcass traits. No two breeds offermore commitment to profitability. SimAngusTM refers to cattle with the following characteristics: the animal is at least ¼ Simmental and ¼ Angus or Red Angus and no more than ¾ Simmental or no more than ¾ Angus or Red Angus; the animal’s parents are both registered in the database of the American Simmental Association; and the sum of Simmental and Angus or Red Angus blood in the animal is at least ¾. Resolution #1: that the Board approves ASA’s designation on registration certificates SimAngusTM HT for animals that meet ASA’s SimAngusTM requirements and have a minimum of 1/8 Bos indicus. Resolution passed. SimAngusTM is a federally trademarked title held by the American Simmental Association. "SimAngus Do the Best Job"
Dan Rieder, Editor, SimTalk "Making a Logical Case for SimGenetics"
Marty Ropp, ASA Field/Commercial Services Director "Defining the Value of SimAngus"